The New York Daily News cover from Tuesday, April 16. Behind her, a man kneels over a badly injured woman, her right leg torn to shreds. The photo, snapped by the Boston Globe's John Tlumacki, has become one of the iconic images of the Boston Marathon bombing. The New York Daily News chose the photo for its wraparound cover on Tuesday. 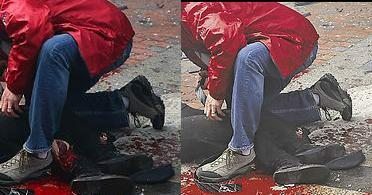 But problematically, the image appears to be altered to clean up the injured woman's leg. After disasters like Monday's, news organizations must grapple with how much of the devastation to show -- if they choose to show it at all. Another image that made the rounds after the bombing was 27-year-old Jeff Bauman, being wheeled off the road, his feet blown off and his calves in shreds.